Hi all! 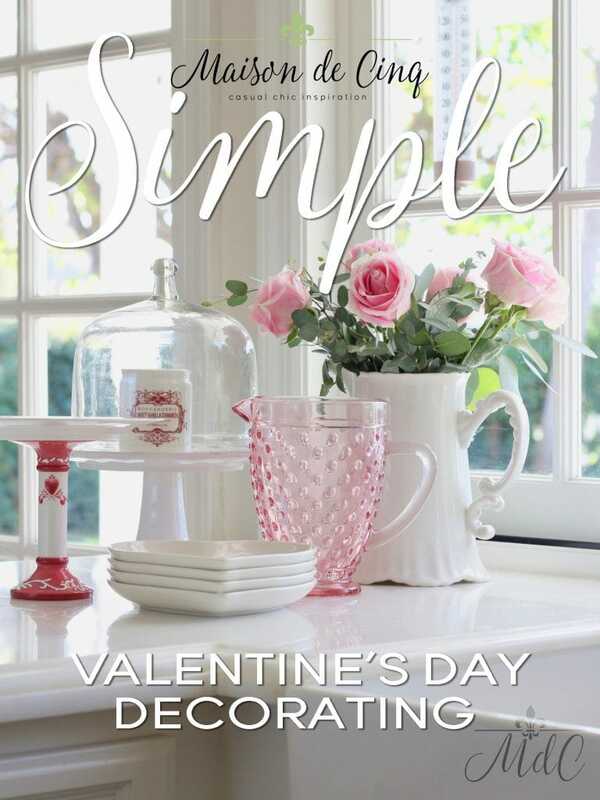 Today I’m joining a Valentine’s Day decorating blog hop and we’re all sharing some simple Valentine’s decorating ideas! Usually I don’t do a lot for Valentine’s Day, especially since my children are a little older now. But I do love a touch of pink as a nod to the holiday, and of course, you know how much I love flowers! What I love most about flowers is that they lend themselves to any season, and you can use them in a myriad of ways. So here are some simple Valentine’s Day decorating ideas with flowers…. What could say “Valentine’s Day” more than pretty pink roses?! 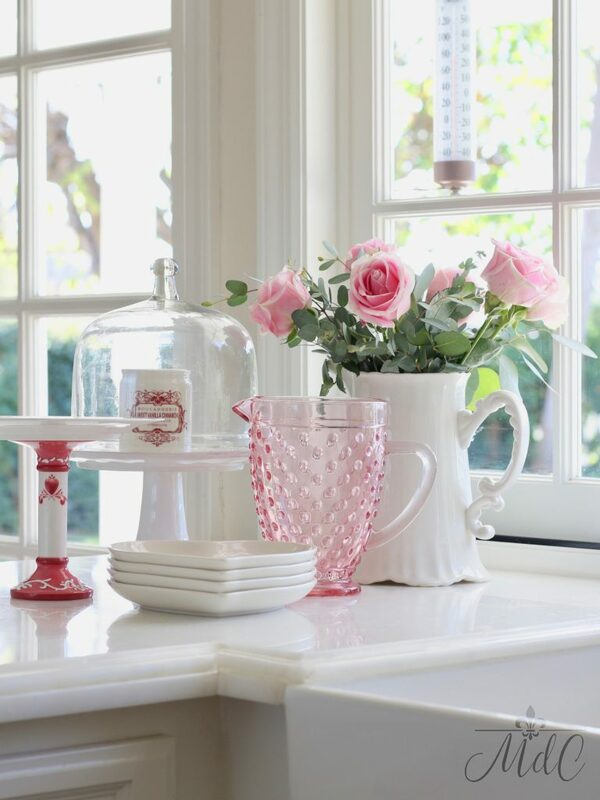 And I love pink against the white kitchen! For me, the best Valentine’s Day decorating is the simplest. 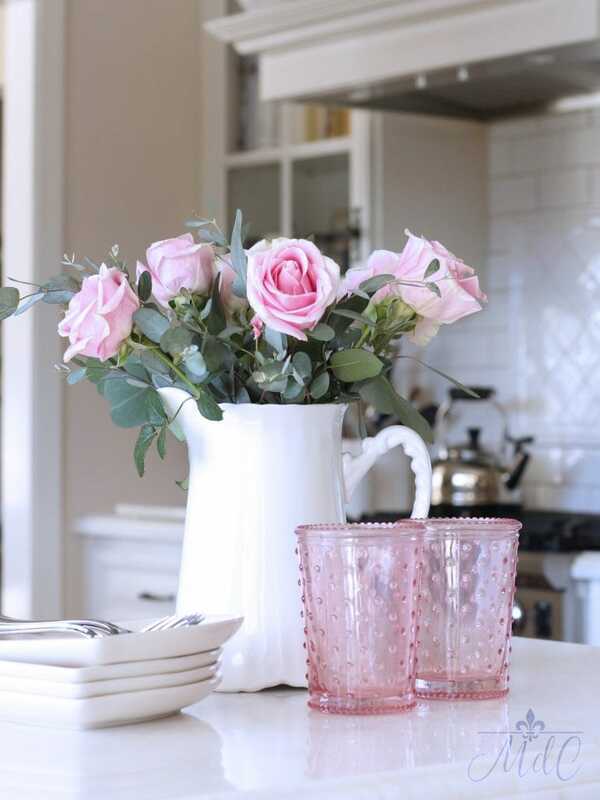 Here I gathered my hobnail pink pitcher along with a cake plate, my Valentine’s heart plates (you can see them in my tablescape here), and a pitcher of pink roses to create a focal point on the counter. In the living room, I used the pink roses from my Valentine’s tablescape, because, well, why not? 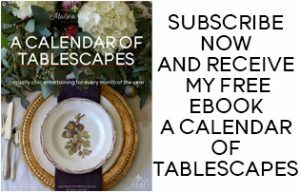 I had to do the tablescape in January for a blog hop, and I couldn’t keep the Valentine’s table out all that time, so I’ve been enjoying the roses in here. Believe it or not, these roses and the little white flowers lasted a full three weeks! I find the softer pink of these roses to be so soothing and serene. And definitely romantic! I found this old cake plate that is done in reddish-pinks and brought that out too! If you simply look around your house, you may find you have more pink or red than you thought! 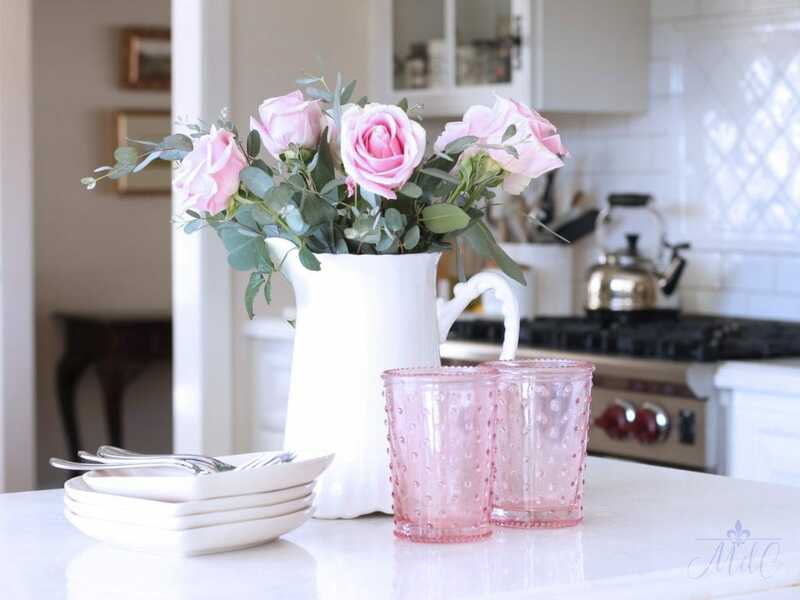 You can easily use any red dishes, etc from Christmas, and if you don’t own any pink, then simply do as I did and put some pretty pink flowers in a white pitcher or vase. This week instead of pink roses, I went with pink tulips! And I love the darker pink roses, too! Last year I did mostly red and white for my Valentine’s decorating, which you can see in this post. Which is why this year I was really wanting to just use the pinks. 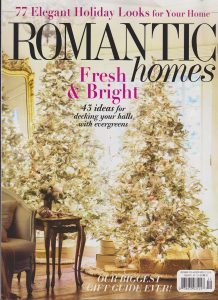 It created a softer, more romantic version of the holiday, which is what I was going for! So beautiful roses and tulips! Although Valentine’s day was fewweeksago, I’d stiil saabig “YES” for this lovely decoration and for decorating with flowers at all 🙂 I use flowers whenever I need to add some color at home. Flowers are always the best choise! Greets! Yes Isabelle! I couldn’t agree more! Flowers are always a wonderful choice and I also use them whenever I can. They really just brighten up any space don’t they?! Thank you very much for stopping by and for taking the time to comment, I so appreciate it! Such a beautiful post Sheila! I will be featuring you on my blog tomorrow for Thursday Favorite Things. Happy Valentine’s Day! Aww how sweet! Thank you for such a wonderful surprise! I really appreciate it. Happy Valentine’s Day to you too Amber! Thanks so much Judy! Happy Valentine’s Day! I love all of the pinks, everything looks so beautiful! 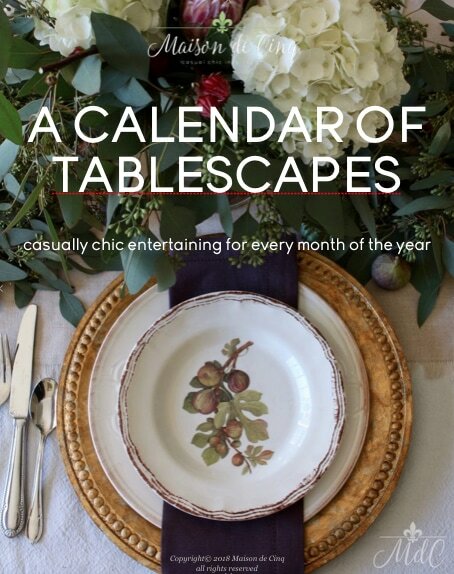 I invite you to share your lovely blog at my party ( you can link up until midnight. Hugs! Please tell me where you got your window shade, I love it! Hi Patti! Mine is custom and unfortunately I don’t know the brand as it was ordered through my drapery guy. However, check out Hunter Douglas as I have a friend that has one that looks almost exactly like mine and hers was Hunter. Good luck! So romantic and lovely, Sheila! I love those gorgeous flowers. And you are right… Shopping your home is a great way and moving things around to keep it feeling fresh and new. Beautiful job! Thank you ladies! Those pink glasses are so popular – and they were Target!! Love all your flowers. I feel that they can totally make a room stand out! Flowers can take center stage anytime and they are so fresh and gorgeous. Great post and thanks for joining us this month! Thanks for having me!! Happy Valentine’s Day! 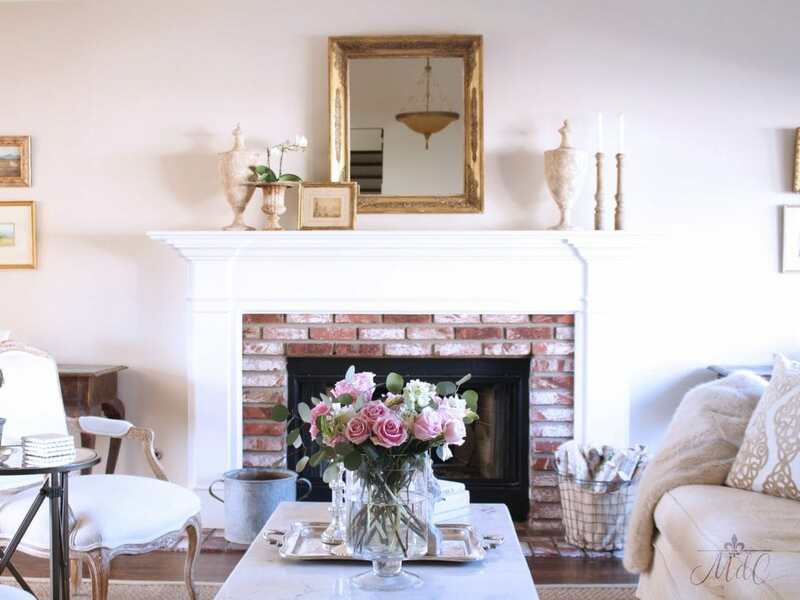 I love the way you brought pink in your home with flowers! Gorgeous Sheila! Happy Valentine’s Day! 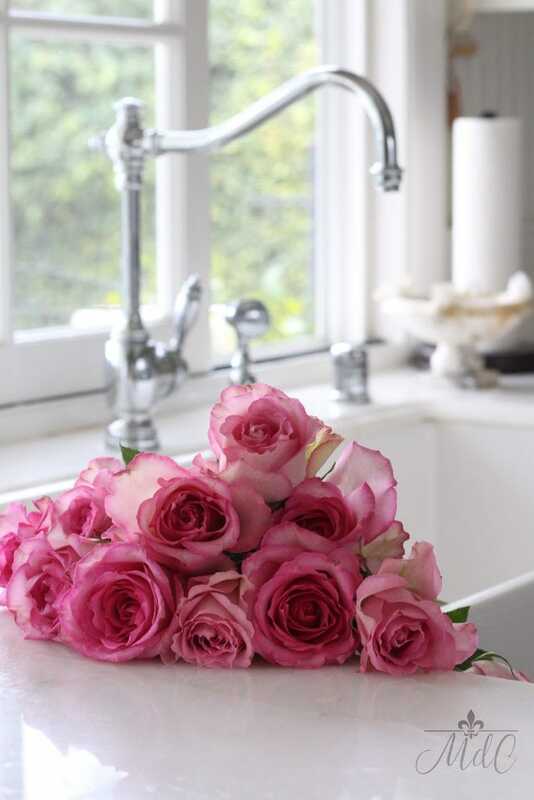 Even though Im not a girly girl I am still in love with pink roses! Beautiful job Sheila! Same here! There is just something about them isn’t there?! 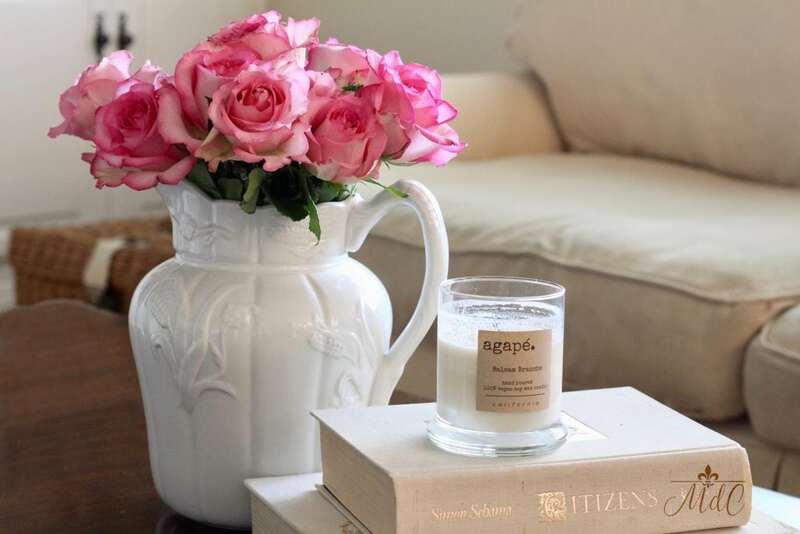 Love your simple yet strikingly beautiful arrangements! Thank you so much Martha! And yes – fresh flowers are just the best! What they do for my home, and my mood, for a few dollars is amazing! Sheila these are just the prettiest touches! 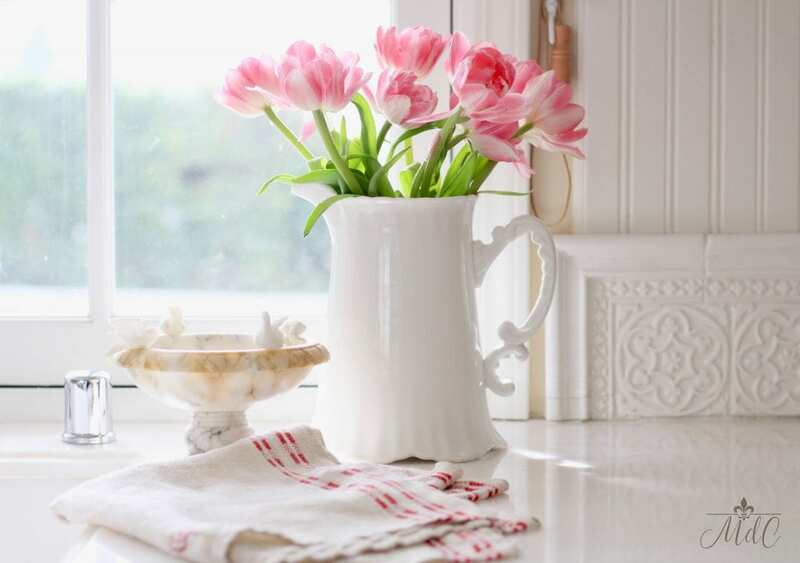 That pink pitcher is beautiful! Thank you Jackie! I love it too! 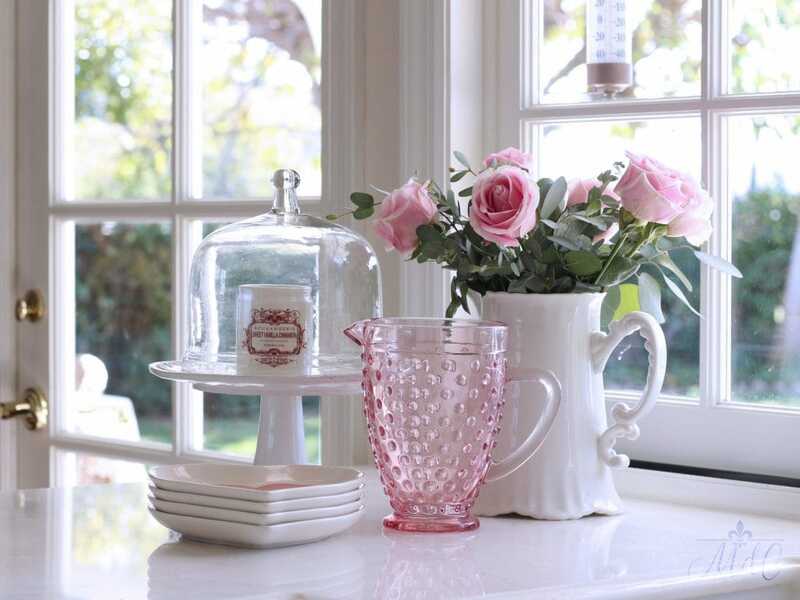 The sweet hobnail style is so old-fashioned and charming! Beautiful Sheila! I love your subtle touches for Valentine’s Day. As always, love seeing your beautiful home! Thank you Ashley! Heading over to yours now! Yay for pink! Thanks Rhonda! 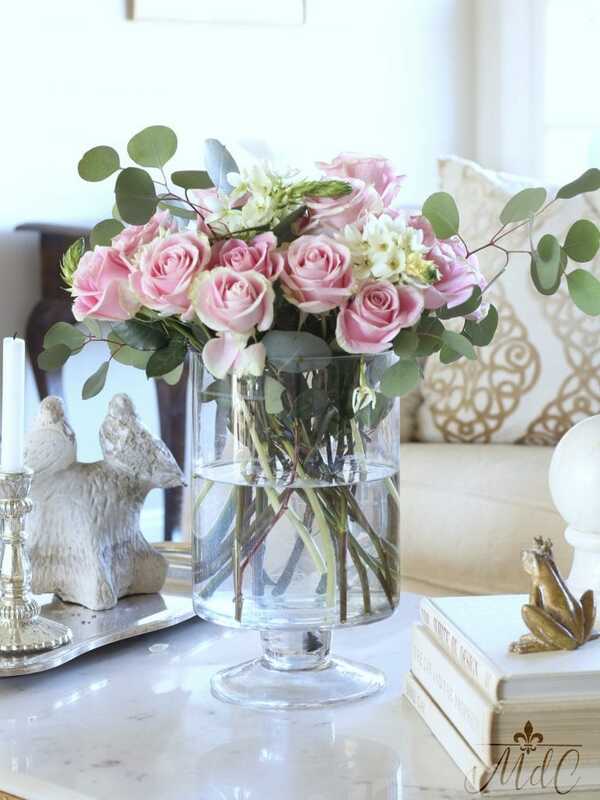 Beautiful arrangements of gorgeous pink flowers throughout your beautiful home that truly say that Romance is in the air! 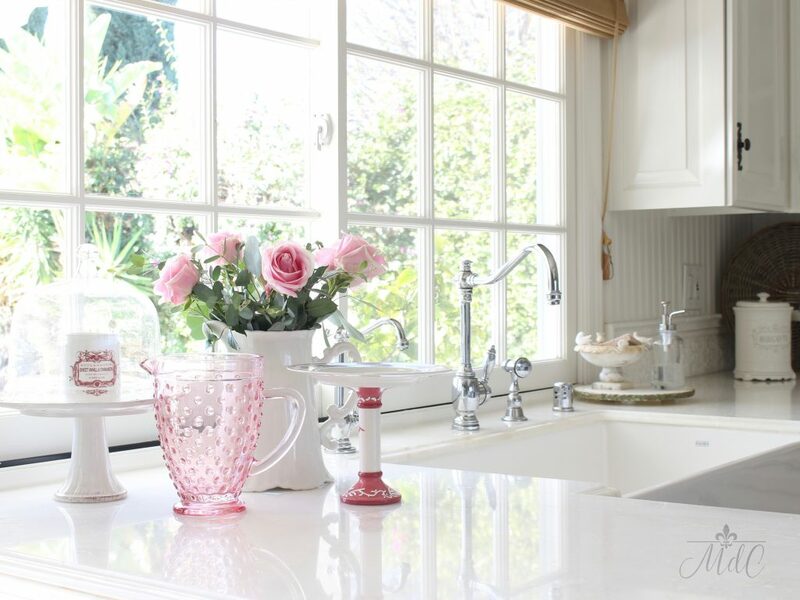 I just love the beautiful window in front of your sink. Gorgeous photos!